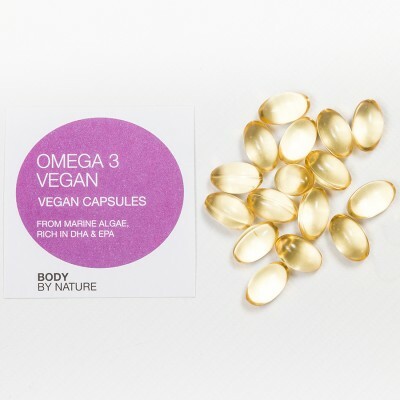 Derived from the plant marine algae ‘Schizochytrium sp microalgae’ this is the first supplement to offer good sources of DHA and EPA for vegetarians and vegans. Algal Omega-3 oil has been commercially available for a while but it did not contain meaningful amounts of EPA. The microalgae in this supplement is grown in a controlled environment, eliminating the risk of oceanic contamination. A plant algae source of the important Omega 3 fatty acid - rich in both DHA and EPA Derived from a completely vegetarian source (Schizochytrium sp microalgae). From microalgae that is grown in a controlled environment, eliminating the risk of oceanic contamination. From start to finish, it is produced in an FDA-inspected facility, under current Good Manufacturing Practice (cGMP) regulations. Research for algae derived DHA & EPA is demonstrating superior effectiveness over fish oil sources. It is believed the Phlorotannins (powerful antioxidants found in brown algae) could be the main responsible component of this finding. 2 gluten-free capsules will provide 334.0mg DHA and 166mg EPA (on average). We buy from the source 'cut out the middleman' and go straight to the original source - the algae itself! We grow our own algae in purified pools of water. This means we don't damage any ecosystems, and we get the purest form of Omega 3 available. Omega 3 found in algae is of the 'DHA' variety, so while you may be getting plenty of Omega 3 ALA from nuts, seeds and flaxseed - algae is the only plant-based source of Omega 3 DHA. If you are on antithrombotic drugs or have any deficiency of the liver consult your doctor before taking this product . Soft gel capsule (modified cornstarch, glycerol) tocopherol (antioxidant), sunflower oil, ascorbyl palmitate. wheat, gluten, soy, yeast, lactose, dairy products, added sugars, colours, artificial flavours and preservatives.